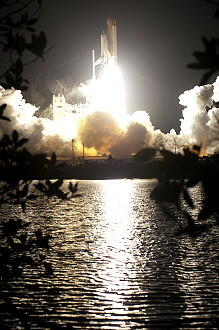 The first launch attempt was scheduled for February 07, 2010, but was scrubbed due to clouds over the Kennedy Space Center. Space Shuttle Endeavour's (ISS-20A Tranquility - formerly: NODE 3, Cupola) primary payloads were the Tranquility module and the Cupola. The major tasks for the mission are to install, activate and checkout Tranquility, including connecting internal and external avionics, cables, and ammonia cooling system jumpers; relocating the Cupola from the end port of Tranquility to its Earth-facing port and then activating and checking out the Cupola; relocating the Pressurized Mating Adapter 3 (PMA 3) from the top of the Harmony node to the port side of Tranquility; and transferring water, equipment and experiments to the station. The European-built NODE 3 is the final one of the three International Space Station nodes, which will be launched into orbit. The nodes are the interconnecting elements between the various pressurized modules on the space station. They provide a shirtsleeve environment to allow the passage of crew members and equipment through to other station elements and provide vital functions and resources for the crew members and equipment. 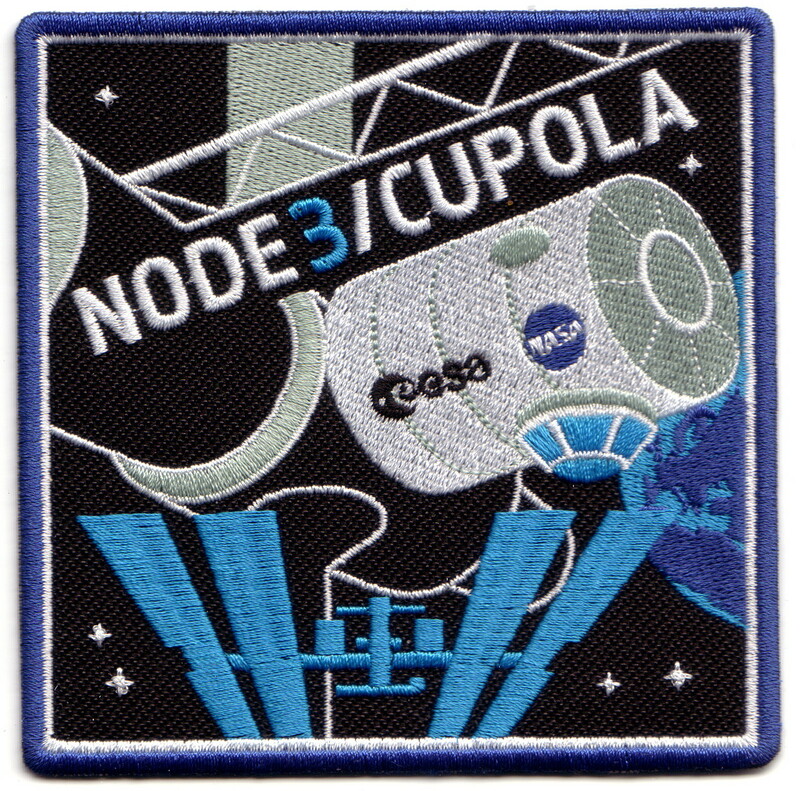 NODE 3 has systems, which provide many different functions and resources to the attached modules, and to itself, for maintaining a safe and ideal working and living environment on board the space station. Today's NODE 3 is significantly different from the NODE 3 that Europe initially agreed to develop back in 1997. It has evolved over the years from a connecting module into a very complex element, able to accommodate sophisticated crew and life support equipment, with many more capabilities than originally foreseen. NODE 3 will support a six-member Expedition crew on the station by accommodating relevant hardware as well as supporting NODE 3 cabin crew operations. NODE 3 consists of a pressurized cylindrical hull 4.5 meters (4.9 yards) in diameter with a shallow conical section enclosing each end. It is almost 7 meters (7.65 yards) long and will weigh together with the Cupola more than 13.5 tons at launch. The pressurized shell of NODE 3 is constructed from aluminium alloys. This is covered with a multi-layer insulation blanket for thermal stability and around 75 sections of panelling to act as a protective shield against bombardment from space debris. This panelling is also constructed of an aluminium alloy, together with a layer of Kevlar and Nextel. Internal and external secondary structures are used to support the installation of equipment, piping and electrical harnesses. Two water loops (respectively low-temperature and moderate-temperature loops) allow the rejection of the heat generated inside the element to the station ammonia lines by means of two heat exchangers mounted on the external side of one end cone. NODE 3 can be considered in two halves. One half has a single docking port on one of the end cones where NODE 3 will be docked to the station. This half also accommodates eight standard-sized racks, which will house relevant systems and equipment. 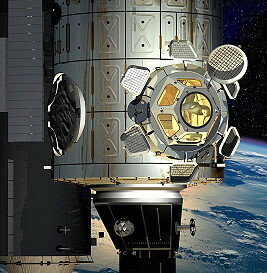 The other half consists of an additional five docking ports, one on the other end cone and four arranged around the circumference of the cylindrical main body of NODE 3. Originally, the Habitation module, the Crew Return Vehicle and Pressurized Mating Adaptor 3 (PMA-3) were to be attached to NODE 3 along with the Cupola. However, the first two elements were removed from the station configuration and PMA-3 will be moved to the port-side docking port of NODE 3 once it is installed. In its launch configuration in the shuttle's cargo bay, NODE 3 will have the Cupola attached to the end cone that will eventually face out from the station and be connected to PMA-3. Inside NODE 3, the eight rack locations will be taken up with two avionics racks, three racks containing pallets with equipment and cargo for the station, with the three remaining racks remaining empty. In its final in-orbit configuration NODE 3 will look slightly different. 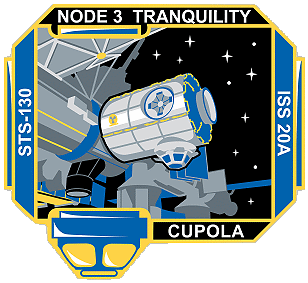 The Cupola will be relocated to the Earth-facing port of NODE 3 during the STS-130 mission. The three cargo pallet racks will be removed and returned on shuttle flight STS-131 in March 2010. In place of these three rack locations and the three empty rack locations will come six new racks which are already on the station. These include the second Air Revitalization System rack for air composition monitoring including carbon dioxide removal; an Oxygen Generation System rack for producing oxygen from water; Water Recovery System Racks 1 and 2 for urine and water processing; a Waste and Hygiene Compartment Rack for crew waste and hygiene processing and a second treadmill. NODE 3 also will be outfitted with the Advanced Resistive Exercise Device for crew in-orbit physical exercise. All these racks and equipment are necessary since the station crew number was increased from three to six in the spring of 2009. The Cupola will become a panoramic control tower for the International Space Station, a dome-shaped module with windows through which operations on the outside of the station can be observed and guided. It is a pressurized observation and work area that will accommodate command and control workstations and other hardware. Through the robotics workstation, astronauts will be able to control the space station's robotic arm, which helps with the attachment and assembly of the various station elements, very much like the operator of a building crane perched in a control cabin. At any time, crew members in the Cupola can communicate with other crew members, either in another part of the station or outside during spacewalk activities. Spacewalking activities can be observed from the Cupola along with visiting spacecraft and external areas of the station with the Cupola offering a viewing spectrum of 360 degrees. 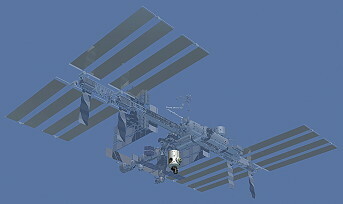 Thus, the Cupola will have an important role in external space station activities. However, the Cupola will operate as more than a workstation. With a clear view of Earth and celestial bodies, the Cupola will have scientific applications in the areas of Earth observation and space science as well as holding psychological benefits for the crew. The Cupola is a 1.6-ton aluminium structure about 2 meters (2.18 yards) in diameter and 1.5 meters (1.64 yards) high. Its dome is a single forged unit with no welding. This gives it superior structural characteristics, which helped shorten the production schedule and lower overall costs. 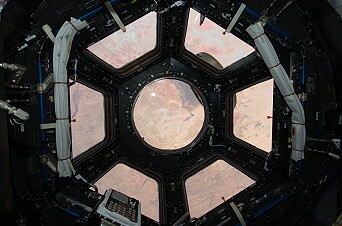 The Cupola is a "shirtsleeve" module with six trapezoidal side windows and a circular top window of 80 cm (31.5 inches) in diameter, making it the largest window ever flown in space. Each window is built using very advanced technologies to defend the sensitive fused silica glass panes from years of exposure to solar radiation and debris impacts. The windows are protected by special external shutters, which can be opened by the crew inside the Cupola with the simple turn of a wrist. At the end of their tasks, the window shutters are closed to protect the glass from micrometeoroids and orbital debris and to prevent solar radiation from heating up the Cupola or to avoid losing heat to space. Each window has three subsections: an inner scratch pane to protect the pressure panes from accidental damage from inside the Cupola; two 25 mm-thick (.98-inch) pressure panes to help maintain the cabin pressure and environment (the outer pane is a back-up for the inner pane); and a debris pane on the outside to protect the pressure panes from space debris when the Cupola shutters are open. The 10-year in-orbit lifetime calls for user-friendly replacement of the windows while in orbit. The entire window or the individual scratch and debris panes can be replaced in space. To replace an entire window, an astronaut would first fit an external pressure cover over the window during a spacewalk. Internally, the Cupola must provide functions to support the presence of two astronauts operating the instruments. Cupola's internal layout is dominated by upper and lower handrails around the inside of its cabin supporting most of the equipment and by "close-out" panels, which cover the harness and water lines attached to the Cupola. These internal panels form a pressurized air distribution system with the outer structure. These panels are removable to allow inspection and connection of different utilities. Most of the flight day 2 was spent on conducting the standard inspection of the thermal protection system (TPS). 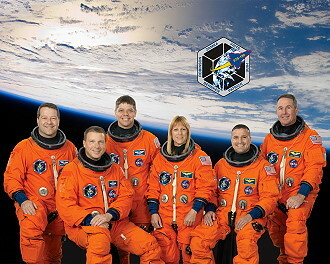 All six of the crew members participated at one point during this task. Once the inspection process had moved to the port wing, astronauts Robert Behnken and Nicholas Patrick began working on checking out and preparing the spacesuits that will be used during the mission's three spacewalks. Once the survey of the TPS was complete, Stephen Robinson and Kathryn Hire, with Robert Behnken joining once his spacesuit tasks were complete, began checking out and preparing the tools that will be used during the rendezvous with the International Space Station (ISS). These tools include a hand-held LIDAR gun used for finding out the closing rate of the shuttle and distance from the ISS, the Orbiter Docking System (ODS) which is the part of the shuttle that connects to the space station and a centerline camera in the ODS to assist the commander George Zamka during docking. 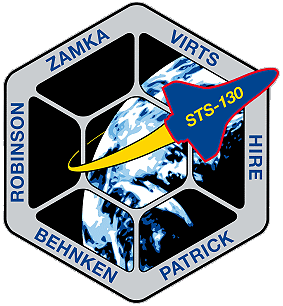 Endeavour's launch for the STS-130 mission is precisely timed to lead to a link up with the International Space Station about 220 miles above the earth. A series of engine firings during the first two days of the mission brought the shuttle to a point about 50,000 feet (15,240 meters) behind the station. Once there, Endeavour started its final approach. About 2.5 hours before docking, the shuttle's jets were fired during what is called the terminal initiation burn. The shuttle covered the final miles to the station during the next orbit. As Endeavour moved closer to the station, its rendezvous radar system and trajectory control sensor provided the crew with range and closing-rate data. Several small correction burns placed the shuttle about 1,000 feet (304.8 meters) below the station. Commander George Zamka, with help from Pilot Terry Virts and other crew members, manually flew the shuttle for the remainder of the approach and docking. George Zamka stopped Endeavour about 600 feet (182.9 meters) below the station. 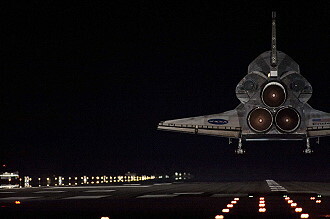 Once he determined there was proper lighting, he maneuvered the shuttle through a nine-minute backflip called the Rendezvous Pitch Maneuver, also known as a the R-bar Pitch Maneuver (RPM) as Endeavour is in line with an imaginary vertical R-bar directly below the station. During this maneuver, station crew members Jeffrey Williams and Oleg Kotov used digital cameras with 800 mm and 400 mm lenses, respectively, to photograph Endeavour's upper and bottom surfaces through windows of the Zvezda Service Module. The 800 mm lens provided up to one-inch (2.5 centimeters) resolution and the 400 mm lens up to three-inch (7.6 centimeters) resolution. When Endeavour completed its backflip, it was back where it started, with its payload bay facing the station. George Zamka then flew the shuttle through a quarter circle to a position about 400 feet (121.9 meters) directly in front of the station. From that point he began the final approach to docking to the Pressurized Mating Adapter 2 at the forward end of the Harmony node. The shuttle crew members operated laptop computers that process the navigational data, the laser range systems, and Endeavour's docking mechanism. Using a video camera mounted in the center of the Orbiter Docking System, George Zamka lined up the docking ports of the two spacecraft. He paused the shuttle 30 feet (9.14 meters) from the station to ensure proper alignment of the docking mechanisms. He maintained the shuttle's speed relative to the station at about one-tenth of a foot per second (3 centimeters per second), while both Endeavour and the station were moving at about 17,500 mph (28,163 km/h). George Zamka kept the docking mechanisms aligned to a tolerance of three inches (7.6 centimeters). 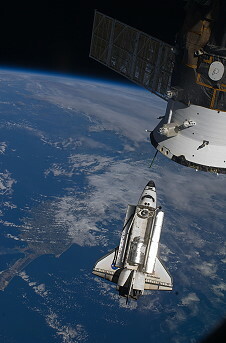 When Endeavour made contact with the station on February 10, 2010, preliminary latches automatically attached the two spacecrafts. The shuttle's steering jets were deactivated to reduce the forces acting at the docking interface. Shock absorber springs in the docking mechanism dampened any relative motion between the shuttle and station. Less than two hours later, hatches were opened between the two spacecraft and a combined crew of 11 began eight days of work. Endeavour's crew was working with Expedition 22 commander NASA astronaut Jeffrey Williams and Flight Engineers cosmonaut Maksim Surayev, NASA astronaut Timothy Creamer and Japan Aerospace Exploration Agency astronaut Soichi Noguchi. Soichi Noguchi and Stephen Robinson flew together on the STS-114 space shuttle return-to-flight mission in 2005. After a station safety briefing, Nicholas Patrick and Timothy Creamer operated the station's robotic arm to remove the OBSS from Endeavour's payload bay and handed it off to the shuttle robotic arm being operated by Terry Virts and Kathryn Hire. The next day, Endeavour's crew began transferring supplies from the middeck to the station, including spacewalking equipment. While Nicholas Patrick and Robert Behnken were getting the tools ready, commander George Zamka and ISS Flight Engineer Soichi Noguchi swapped out the Hard Upper Torso (HUT) on Robert Behnken's suit, since the original HUT had developed a problem with a wire harness and was not powering the Wireless Video System (WVS) or the heaters in his gloves and boots. Once the swap was complete, George Zamka and Soichi Noguchi tested the suit successfully. The crew also performed a number of transfer related activities during the morning of their work day. After a joint meal together, the crew of STS-130 and ISS commander Jeffrey Williams and Flight Engineer Timothy Creamer conducted a PAO event with T.V. stations in Sacramento, California, Mobile, Alabama and a radio station in St. Louis, Missouri. 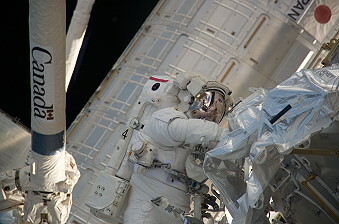 The first EVA by Robert Behnken and Nicholas Patrick occurred on February 12, 2010 (6h 32m) to remove a cover that has been in place to protect a port on the Unity node, the location where Tranquility was attached robotically halfway through the spacewalk. Next, the spacewalkers removed and stored a spare parts platform from the Special Purpose Dexterous Manipulator, or Dextre, a two-armed space station robot capable of handling delicate assembly tasks currently performed by spacewalkers. Finally, they installed four electronics systems cables between Unity and Tranquility to bring the new node to life. The first order of business, once Robert Behnken and Nicholas Patrick began the first spacewalk of the mission, was the preparation of the new Tranquility node for installation on the Unity node. Robert Behnken began by moving to Unity and opening a flap that will expose Unity's centerline camera, which was used to line up the two nodes during installation. He then removed eight contamination covers from the port on Tranquility that was docked to Unity. While Robert Behnken was doing so, Nicholas Patrick began by installing an electric circuit on the avionics panel of Tranquility and removing cables that provide the node power from the shuttle before its installation. After a trip back to the airlock to retrieve insulation and jumpers to be stored for use in a later spacewalk, both Robert Behnken and Nicholas Patrick came together at the special purpose dexterous manipulator - or Dextre - to remove its orbital replacement unit temporary platform, a storage platform that allows the robot to carry spare parts. They retrieved two handles from storage and installed them on the robot and the platform, then worked together to release the four fasteners connecting the platform to the robot. Robert Behnken carried the platform to a stowage bin on the left side of the station's truss, where it will be available for use as a backup to a new enhanced platform that was installed on Dextre during the STS-132 mission. While that work was going on, Terry Virts and Kathryn Hire had unloaded Tranquility from Endeavour's cargo bay and installed it on the Unity node, at which point Robert Behnken and Nicholas Patrick began hooking it up. Nicholas Patrick began by connecting Tranquility's heater cables to Unity to provide a temporary power supply. Robert Behnken, meanwhile, connected eight avionics cables between the nodes. From inside the station, Terry Virts and Kathryn Hire used the station's robotic arm to remove Tranquility from the shuttle's payload bay maneuvered and installed then installed the node onto the port side of the Unity node. Tranquility was built for NASA by Thales Alenia Space in Turin, Italy, under contract to the European Space Agency. 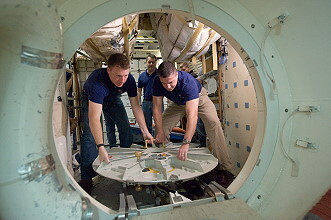 On flight day 6 members of the joint crew opened the hatches to the new Tranquility module for the first time. STS-130 crew-members George Zamka, Terry Virts, Stephen Robinson and Kathryn Hire all helped in the initial outfitting of the node. During the initial outfitting, Terry Virts and Kathryn Hire prepared the Cupola for its move from the end of NODE 3. While that was going on spacewalkers Robert Behnken and Nicholas Patrick re-sized and repaired Robert Behnken's original suit for use by Nicholas Patrick, after a small problem with a fan was discovered. Once that task was complete the pair began getting their tools ready for the second of three spacewalks. The second EVA was again performed by Robert Behnken and Nicholas Patrick on February 14, 2010 (5h 54m) to install ammonia plumbing connectors between Unity and Tranquility and covering them with thermal insulation. When turned on, the ammonia will provide cooling to Tranquility. Then they prepared a port on the Earth facing side of Tranquility for the flight day 8 relocation and attachment of the Cupola. Robert Behnken and Nicholas Patrick spent the first four hours of their second spacewalk connecting the ammonia loops on the new Tranquility node to those of the Destiny laboratory. There are two loops, with two lines apiece, each of which had to connect to both Tranquility and Destiny and routed through a bracket on Unity, which connects Tranquility to Destiny. Robert Behnken opened one of the loops so that ammonia was allowed to flow to the node from the station's external thermal control system. Once that task was complete, the spacewalkers spent the remaining time outfitting Tranquility. Robert Behnken installed insulation on the keel pin and four trunnions that connected Tranquility to the shuttle while it was in transit. He also set up the centerline camera on the nadir, or Earth-facing, port of Tranquility and released the launch locks that held the petals of the port's berthing mechanism in place during launch. The Cupola was moved to that port the following day. While Robert Behnken worked on that, Nicholas Patrick installed eight handrails and a vent valve on Tranquility. The handrails will be used by spacewalkers to move along the exterior of the node, and the vent valve will be part of the atmospheric control and resupply system. That was Nicholas Patrick's final task of the spacewalk. Robert Behnken wrapped up his duties by removing tape on five gap spanners that act as a bridge for astronauts between areas on Tranquility without handrails. On flight day 8, the Cupola was successfully moved from its launch location to its permanent location on the earth facing side of Tranquility. 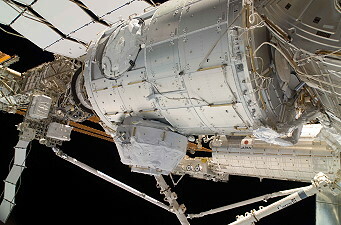 Cupola was moved by the space station robot arm (SSRMS), which was operated by Kathryn Hire and Terry Virts. ISS commander Jeffrey Williams assisted them by releasing the bolts and hooks that held the Cupola in place and then securing it to its new home. The process was slightly delayed due to some bolts that were torqued tighter than expected on the ground, but flight controllers were able to increase the torque to release the bolts. Once the move of the Cupola was complete, outfitting continued to get the Cupola ready. The crew was able to ingress it the next day, but the window covers were not be opened until after the third and final spacewalk. While the Cupola relocation was going on, some of the crew members participated in transferring items between the shuttle and station. Also during this time Robert Behnken and Nicholas Patrick prepared the tools that they used during the final spacewalk scheduled for flight day 10. During this time the pair re-sized another spacesuit on station for use by Robert Behnken. This was done because the suit Robert Behnken had been using had some problems with its communications equipment. On February 16, 2010 Nicholas Patrick and Robert Behnken, together with Expedition 22 crew members Jeffrey Williams and Soichi Noguchi, maneuvered the Pressurized Mating Adapter 3 from its location on the Harmony module to the open port on the end of Tranquility. The PMA will provide protection from micro-meteoroid debris. PMA 3 was moved by Robert Behnken and Nicholas Patrick, with help from Jeffrey Williams and Soichi Noguchi to release the PMA 3. During the PMA 3 relocation, Kathryn Hire and Terry Virts continued work on outfitting the Cupola. 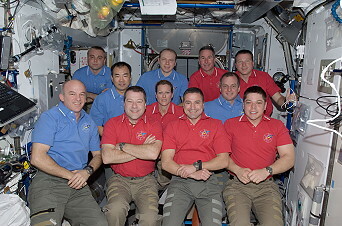 The joint Expedition 22/STS-130 crews enjoyed a meal together and had some off-duty time in the 2nd half of their day. Before the scheduled bedtime the entire crew conducted another EVA procedures review for the third and final EVA of the mission. 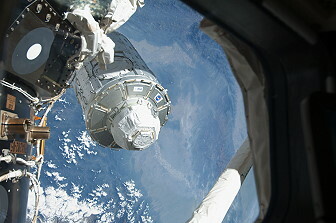 The third and final EVA by Robert Behnken and Nicholas Patrick occurred on February 17, 2010 (5h 48m) to turn on the ammonia cooling lines between Unity and Tranquility, installing heater and data cables on Tranquility, removing insulation and launching locks from the newly-installed Cupola, and installed handrails on the outside of Tranquility. Tranquility outfitting continued on the third and final spacewalk of the mission. 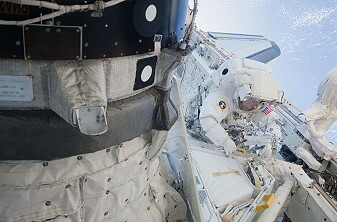 Robert Behnken opened the second of the two ammonia loops he and Nicholas Patrick routed during the previous spacewalk, and disconnected the temporary power cables Nicholas Patrick set up during the first spacewalk. By this time in the mission, the Cupola was moved to its permanent home on Tranquility's nadir docking port, and the pressurized mating adapter 3 had taken its place on the end of the node. That left Nicholas Patrick and Robert Behnken free to begin getting them into the right configuration. Nicholas Patrick connected the mating adapter's heater and data cables to Tranquility. Then he worked with Robert Behnken to remove six panels of insulation over the Cupola's windows. With the insulation out of the way, Nicholas Patrick was able release the three bolts on each of the seven window's covers; those bolts held the covers in place during Endeavour's launch. While he did so, Robert Behnken got back to outfitting Tranquility by installing four worksite interfaces and five more handrails. 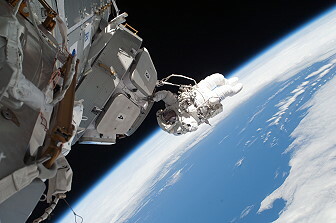 At this point the two spacewalkers came back together to route cables for the station's video signal converter, or VSC. 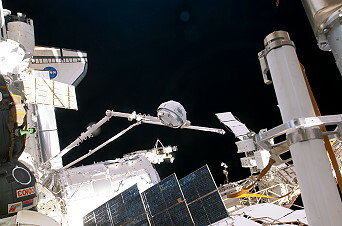 The VSC is used with power and data grapple fixtures, of PDGFs, which provide locations on the exterior of the station's modules for the station's robotic arm to attach to. Robert Behnken and Nicholas Patrick wrapped up the last of the spacewalk activities for the mission with two final tasks. First, they closed off the centerline camera that was used on the zenith, or space-facing, port of the Harmony node when the pressurized mating adapter 3 was attached it. And finally, they each removed six clamps and the flex hose rotary coupler on the port 1 segment of the station's truss. Once the launch locks were removed, pilot Terry Virts opened the windows on Cupola for the first time. 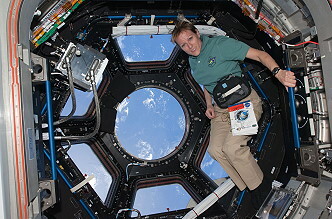 During the day Kathryn Hire and Terry Virts hooked up and transferred the Cupola robotics station for its use in the future. 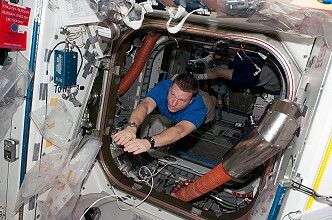 Terry Virts also completed some transfer tasks in the morning. On flight day 11, the joint Expedition 22/STS-130 crew began transferring Environmental control and life support system (ECLSS) racks to the Tranquility module. These transfers were done by ISS commander Jeffrey Williams, Flight Engineer Timothy Creamer, shuttle commander George Zamka and mission specialist Stephen Robinson and took most of the day. Also during the day pilot Terry Virts continued working on getting the Cupola set-up for the robotics work station. He had a small problem installing some corner panels which are needed to hold the workstation. Spacewalkers Robert Behnken and Nicholas Patrick were busy reconfiguring the airlock for use by the station crew and later flights. 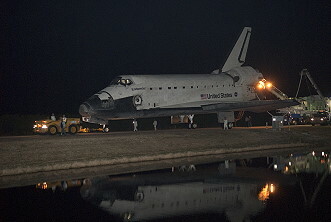 They also transferred their spacesuits and tools back to the shuttle for the return trip home. After the rack transfers were done the crew completed some more transfers and passed the 75% complete mark. 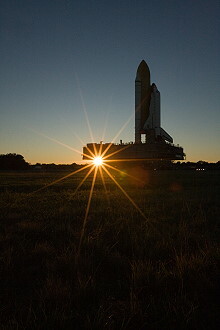 The space shuttle commanded by commander George Zamka and pilot Terry Virts completed a reboost of the station using its vernier thrusters. The remaining days the crew finished packing, reconfigure spacesuits and transfer them to Endeavour, and check out the rendezvous tools that were used for undocking, flyaround and separation. The Endeavour crew said farewell to the five-member station crew and closed the hatches between the two spacecraft. Once the shuttle was about two feet (61 centimeters) from the station and the docking devices were clear of one another, Terry Virts turned the steering jets back on and manually controlled Endeavour within a tight corridor as the shuttle separated from the station. Endeavour moved to a distance of about 450 feet (137.2 meters), where Terry Virts began to fly around the station. Terry Virts circled the shuttle around the station at a distance of 600 - 700 feet (182-213 meters). 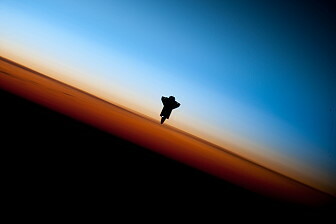 Once the shuttle completed 1.5 revolutions of the complex, Terry Virts fired Endeavour's jets to leave the area. The shuttle began to increase its distance from the station with each trip around the earth while ground teams analyzed data from the late inspection of the shuttle's heat shield. However, the distance was close enough to allow the shuttle to return to the station in the unlikely event that the heat shield is damaged, preventing the shuttle's safe re-entry.